The couple alleged to have taken two bottles from the Co-op store, on Cliff Road, before being challenged by security. Lincolnshire Police are asking for anyone to come forward with information about the two people pictured. A police spokesman said: "We are appealing to identify the man and woman in the images to assist us with a theft investigation. 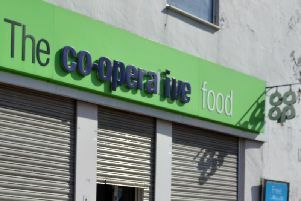 On 23 March, at the Co-op store on Cliff Road, Welton, a man and woman entered the store before taking two bottles of Champagne. "They did hand the bottles back, outside the store, after being challenged by security, before heading in the direction of Cliff Road on foot. "The man was described as white, with dark hair and a long horizontal mark/tattoo on the right-hand-side of his neck, heavy build, with a black coat, green jumper, black trousers and trainers. He appeared approx. 40-50-years-old. "The woman was described as white with long dark hair worn in a ponytail, slim build, with white top, dark trousers/jeans with rips in the knees, dark green coat/jacket and dark footwear. She appeared approx. 45-50-years-old. "If you can help us with our enquiries, call us on 101 using reference number 19000 148484, or by calling Crimestoppers anonymously on 0800 555 111."